Lung function may be affected due to cycles of prolonged inflammation as well as chronic infection of the airways that lead to respiratory diseases like chronic obstructive pulmonary disease (COPD) and cystic fibrosis (CF). Treatment with anti-inflammatory and antibiotic medicines has been observed to be of help for such patients. In COPD and CF, the inflammatory response is generated by the neutrophils; neutrophils also secrete a protease enzyme known as neutrophil elastase (NE), and the presence of this enzyme has been recognized as an important biomarker of inflammation and infection. The patient’s disease status can be monitored by detecting the NE as it corresponds with the occurrence of severe episodes of the activity of the disease. A number of methods have been established to quantitate active proteases and these methods are based on the presence of fluorogenic and chromogenic peptides. In biological samples, these peptides are broken down by other activities and thus do not have the required specificity for precise quantification. NE levels in patient’s samples can be detected and quantified by using the Active NE ProteaseTag™ kit. ProAxsis’ ProteaseTags™ have been designed to bind to and prevent specific proteases. On binding, they bridge a solid support, facilitating their incorporation into a format of immunoassay for particular quantification. Active NE is captured using the NE-Tag in the ProteaseTag™ Active NE Immunoassay (Figure 1). A following antibody step allows further amplification of the signal along with enhanced sensitivity. 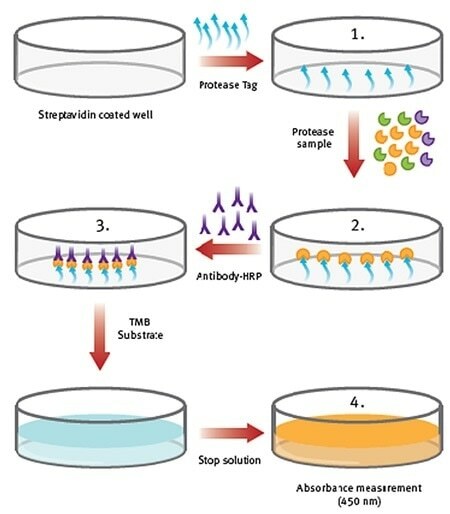 Identification is done within an ELISA-type pattern and results are obtained within a time span of 3 hours. NE-Tag based detection is discriminatory and quantitative. The range of detection for this assay is 1000 to 15.6ng/mL, with a sensitivity of 3.3ng/mL. Figure 1. Procedure overview of ProteaseTagTMActive Neutrophil Elastase Immunoassay. NE-Tag is coated on the plate, which is subsequently washed. Samples and standards are added. Active NE is captured from the sample by NE-Tag, stabilizing and inactivating the enzyme. This is followed by washing. An antibody-conjugate step helps in detecting the complex through the subsequent introduction of a stop solution or colorimetric substrate. The plate is finally measured at 450nm in absorbance mode. Before starting the assay, samples of sputum were obtained from CF patients and the same were processed for a short time. Before adding to the wells in the microplate, the samples and standards were placed on ice, while the other reagents were maintained at room temperature. Dilution of the standards was done and the microplate was prepared in accordance with the instructions provided by the manufacturer. Blanks, standards, and samples were then added in duplicate to the plate. The standards’ spectral profile was first analyzed (Figure 2). 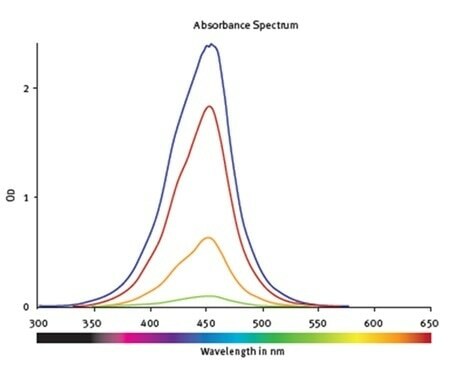 This proved the fact that the optimum wavelength to read the absorbance was 450nm. The software-MARS Data Analysis was used to blank correct the initial raw data. Using the standard curve wizard, a standard curve was produced. The concentration of hNE from individual samples was calculated automatically from the regression curve (Figure 3). Figure 2. Absorbance spectra of samples containing hNE at different concentrations. The values are corrected for the blank. 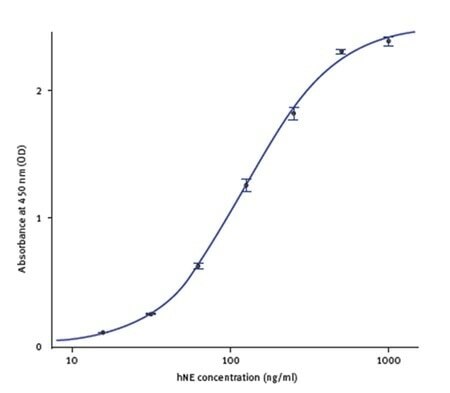 Figure 3. hNE standard curve using hNE standards provided with the kit. The levels of active neutrophil elastase present in any given sample can be assessed in a quick and simple way by using the ProteaseTag™ Active NE Immunoassay. This kit provides a consistent means for detecting inflammation and infection in the given clinical samples, thanks to the accurate quantification of active protease levels by the assay. The quantification of active NE can be done in samples other than airways samples, like wound fluid. When compared to peptide-based substrates, this kit provides greater specificity and selectivity when used with complex samples of biological origin and also correlates well with other activity-based methods for detecting active NE. This can prove important when establishing links between protease biomarkers and other biomarkers of the disease. The ability to fully analyze and read data can be done using the CLARIOstar® microplate reader, thereby providing a method that is both fast and reproducible to run the assay. 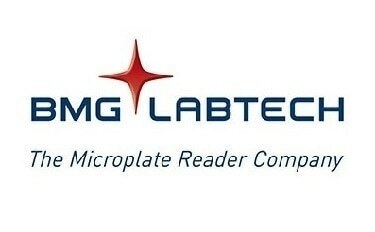 BMG Labtech Ltd., Aylesbury, UK. Elizur, A. et al. (2008) Chest. 133(2), 489-495. Gifford, A.M., Chalmers, J.D. (2014) Curr. Opin. Hematol. 21(1), 16-22. Tetley, T.D. (2005) Curr. Drug Targets Inflamm. Allergy. 4(6), 607-618.